Nicholas Day appears in the TV movie Human Bomb. 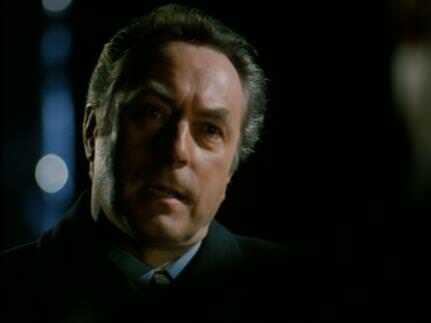 He plays a role of a Police Commissioner, similar to the role he had in Minder. The story starts off with an female American primary school teacher who relocates to Germany to teach kids there. Unfortunately a masked terrorist who is a suicide bomber holds her and the kids hostage in the classroom and the police are called in the situation to listen to his demands. 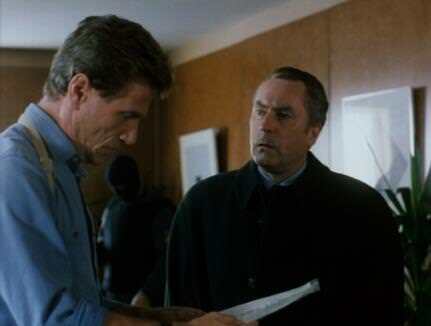 The leads character Gerhardt played by German actor Jürgen Prochnow to be called to the scene to help try stopping the terrorist from blowing up killing himself and the kids. Nicholas Day plays a senior officer who helps Gerhardy trying to defuse the situation to help save the kids and also tries not allow the terrorist to get away with what he is doing with the money. Maybe a break from trying not to get Arthur Daley into jail and have a much more serious role, which could explain why he is in this. Despite being in Germany, you'll think there are German actors to fill the roles of the other characters. Not really, it's a chance to place some English actors in the movie. Wouldn't think there would be any. Even some of the kids are English when they talk and say their lines. It is a TV movie, maybe a late night 90s TV movie. Rather shocking but acceptable at the time. The movie has a DVD re-release in The Netherlands, I got it very cheap from DVD thankfully. I'm not sure why but I know the Dutch like that eerie dark shocking content I think sometimes (with some of the other material that comes out from there) but I would see why this movie had a re-release there. Also wonder why Germany was a place where a terrorist suicide bomber was worth a premise (considering Die Hard was popular during the early 90s) but I think it was just hashed quickly together for TV when they had their chance. It wasn't that bad but not the kind of material I would have expected in my opinion. Quick edit: If anyone wants to go down the road with how Day's character in Minder never caught and vented on Arthur Daley and put him in a movie where his advice to prevent the suicide bomber carries out this plans against school kids, rather intense to think and shocking about considering he never caught and had his way on Daley. Makes anyone wonder what anyone who noticed him there from Minder how this movie would have ended. Thanks to a very generous fellow forum member I have just watched Human Bomb. On the whole, the story is just the sort of thing I like watching and it ain't all bad - however, and this is no offence to German fans on this forum, but when German actors desperately try to do OTT cool, hip & groovy English, sorry it just sounds way too naff and off target for me. To be fair, what they should have done here is have more subtitled German and mixed in the English - they are in the middle of Munich and you don't hear a word of German for 1.5 hours?! So what's the premise here? Well, a nutcase takes over a school with a bomb strapped to him and a large shooter. The classroom is full of diplomats' kids so the hijacker knows he's got some majorly influential people over a barrel. If he gets rumbled and his hand comes off the the bomb it will go off. He wants 50 million Deutschmarks, yes, no Euro here! So ... oh no, what are we to do? Fear not ... we have a Munich super cop Gerhardt Dach (played by Jürgen Prochnow) supervising the response. Is it just me, or is this guy a terrible actor? Anyway, the main issue for me with this film is is, we have all German plod everywhere and they all have either (a) a terrible German accent hamming it up being super cool in English or (b) speaking like they just left Oxford School of Linguistics. Sadly Nicholas Day ain't much better in this either - he plays a chap called Eicher (which translates as "calibrator" which is a bit like what he does in this) - Nick plays state secretary of Bavaria (not a Police Commissioner as IMDb suggests) - he is a politician from what I can see. Anyway, even our Nick acts as if he's supposed to be German and is walking about with a middle England accent. Sorry, the accents are all way too wrong in this film for me. Anyway, terrible accents aside the story line isn't actually that bad - this is basically Patsy Kensit's film - she plays a recently widowed American who through nepotism lands herself a job at an international school in Munich. She is kept in the school alongside all the spoilt kids by the hijacker. Now then, on a good day, Patsy Kensit isn't an oscar winner for me and she isn't really more than above average in this either - in fact she is pretty dire. So we have bad accents and bad acting. Then we have Nick Day, (who if you think is English in this), he is actually a pretty good - lord only knows how he ended up in this. Then we have the fact it is all filmed in one location for the most part which tells me someone was saving money which never helps any film. No spoilers here, but films like this end up going two ways, happy ending or not so happy ending. The German cop clearly loves himself in this and to be honest, when the film was over I was happy to see the end of his boat on my TV. Then there's actor Dorian Healy (again!) - he's Teddy B in Minder series 11's 'In Vino Veritas' and D.S. Cody in 'Guess Who's Coming to Pinner'. 5/10 - despite the really dodgy accents, Patsy Kensit and Jürgen Prochnow showing us how not to act and the cheap and nasty flavour to this film, it is not all that bad. In fairness to the gunman, he threatens the schoolkids and it all looks pretty harrowing for the little ones with a suicide bomber in the room. It wouldn't be top of my 'Not Minder' list but it is certainly not right at the bottom either. The other whacky thing about this film is, even though it is from 1998 to me it feels more like 1989. They also seem to keep banging on about 1972 Munich massacre in this film and how we can not go back to that - ok, get the point but for me they seem to bring it up all the flaming time and would be better orf just leaving out the constant references to it. An OK watch, but lots of negatives. Thanks for the review. It helps. It does feel end of 80s, early 90s for a 1995 movie. I did get that feeling. I completed missed that Nick Day was a state secretary and not the police, maybe just a way to see if Minder followers read the TV guides and to be made to watch the TV movie and I think the German to English accent is from the Schwarzenegger fame (despite being Austrian) during the 80s, so they must have decided that it works and people actually would get into it. It feels like it was forced on the audience but it wasn't that bad as jno reviewed. I would agree with the grade, it was a 5 out of 10. That's surprising. They barely have streetview there for German towns. Nice setting for Human Bomb also.